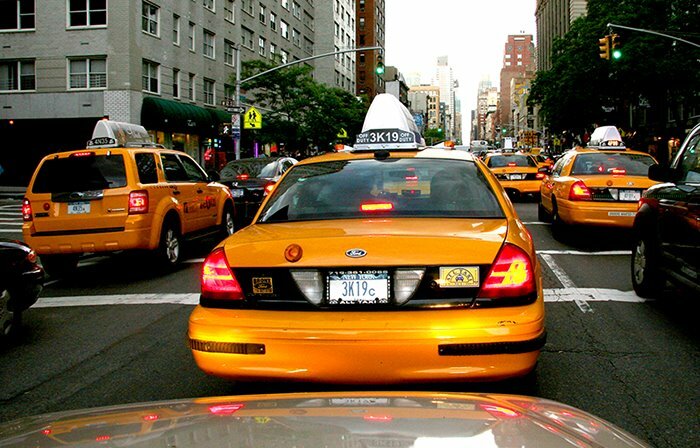 What was most remarkable about my journey in this vehicle was the comment my friend Joey made while driving me uptown - he referred to what we saw as a "sea of yellow" - that is exactly the phrase I have used many times and what was in my mind as we crept through slow moving traffic. I shot a number of photos "blind" by raising the camera through his open sunroof. The evening light really enhanced the already yellow hue of the taxis. Taxis are part of the fabric of this city. Perhaps fabric is too flattering and some would prefer background noise. But in either case, there are many times, as seen in this photo, where yellow dominates the street and rules the eye. When I was a college student, I drove a taxi for about a year and a half. Those were rough times and it was the wild west. It was exciting, though and I learned more about the city more quickly than any other way. It was like orientation on steroids. Although driving is brutal and stressful, it is immediate cash money, so for the student or individual who is living hand to mouth, it can be a good source of income. But it is not for the faint of heart. One of my most popular images in the last two years of doing this photo site is of a taxi crash into a post - see it here.